I recently finished a book, Waking Up In Winter by Cheryl Richardson, which I totally recommend if you're a midlife woman. It's a life journal that explores what really matters at this stage, and I found myself agreeing with so much of what she wrote. But one idea stood out above the others: share your abundance. I'm a big believer in positive thinking. Which doesn't mean I practice it all the time, since I'm the queen of falling back into old habits. But when I stay positive, truly wonderful things happen. Good stuff comes from good thoughts. Cheryl wrote specifically about reframing the way we view spending money on things we'd rather not spend it on, like paying bills or taxes. Instead of seeing it as "wasting your hard earned money", shift the focus to "sharing my abundance with the world". That abundance goes out and helps others stay employed, gather income, and in turn share their own abundance with someone else. And I've already seen it come back to me in positive ways. 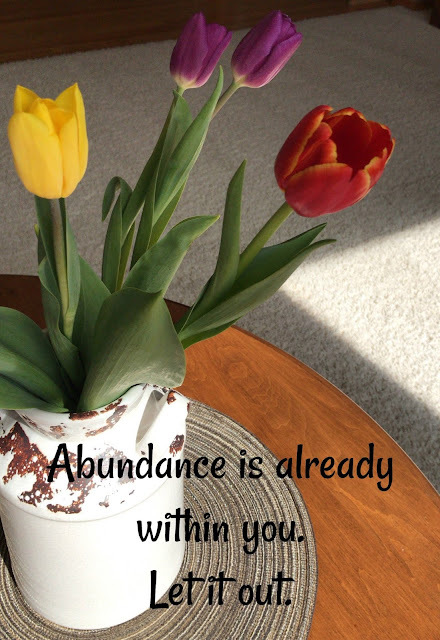 There are so many ways to share your abundance. Share your knowledge, your skills, your talents. Share your kindness, your smile, a helping hand. You can even share your closet. This is only half...HALF of what I donated. And then there's the consignment stuff. Eeks. Over the weekend I decided to do a major closet purge. It was way past time, and honestly a little embarrassing. 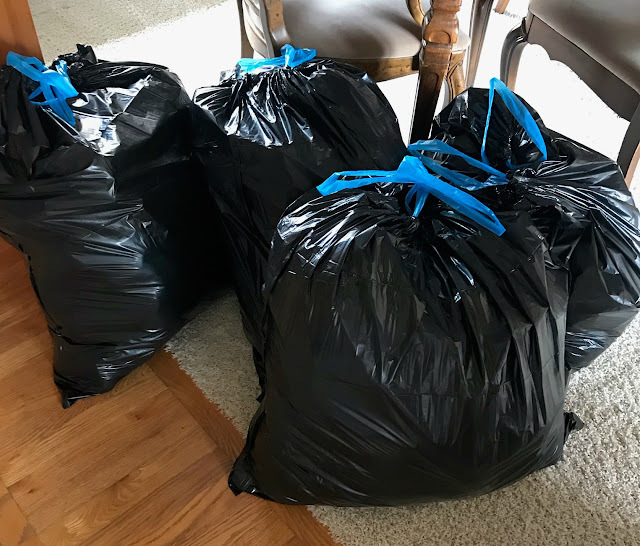 My closet was bursting, with overflow into at least two other closets in the house. I've never considered myself a hoarder, but apparently when it comes to clothes, all bets are off. I had what I referred to as "the archives", because maybe it will fit again, or come back into style, right? Well, no more. The archives are gone, along with all the old bridesmaid dresses, and things I'd held onto because they evoked a good memory. As I dropped them off for donation, I felt a little sad. There are some good pieces in those black bags. Then I thought about sharing the abundance, and it felt good. Someone needs those clothes way more than I do. Plus, now there's room for a few new things. Just kidding. Well, kinda. Shopping is sharing my abundance, non? Happy Thursday, friends! Are you ready for Easter? The Bunny doesn't stop by my house anymore, and we're going to my mom's for dinner on Sunday, so I'm good to go. What are your plans? Today, while my friends from Salt and Light are traipsing around the south of France, I thought I'd style a few items that I recently received from them. First up is the Lorelai Maxi, which comes in black and a deep purple. This dress may be the softest, most comfortable piece of clothing ever. And I'll be wearing it all spring and summer, because it can be styled a zillion ways. 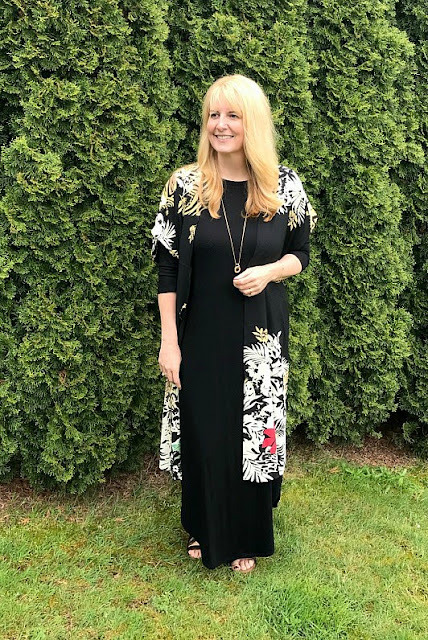 In fact, Deena did a post sharing 13 ways to wear this maxi. I tied it up in front for a more casual look, and I like the hi/low vibe. I topped it with the Fancy Floral Kimono. The print on this kimono is so beautiful. It kind of looks like an animal lurking in the grass, and the splashes of color are bright and gorgeous. 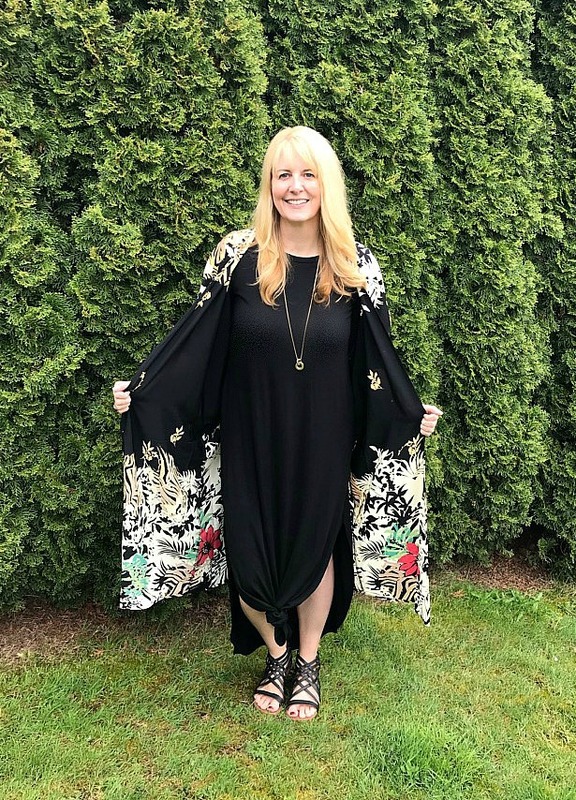 I let the hem down, and without changing anything else, turned this into a date night or evening look. You could add more jewelry or different shoes and make it even dressier. The Lorelei Maxi runs true to size, although it's nice and roomy. I'm 5'9, and the sleeves are 3/4 length on me. It also hits around my ankles. If you're shorter, I think you could size down and it would be perfect. The kimono is very generously sized, and would also be adorable with jeans and a t shirt. I hope you have a very happy Easter weekend. 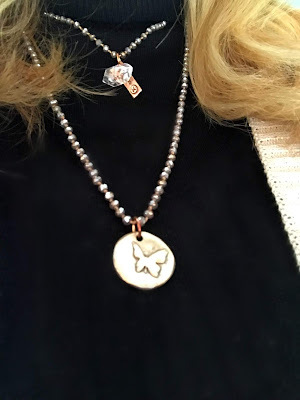 If you haven't already, be sure to visit my post from Tuesday and leave a comment to be entered in a drawing for a beautiful Katia Designs necklace. See you next week! Five years ago, in April of 2014, I hit publish for the first time on this blog. I mentioned last week that my initial inspiration came from the final episode of "Ugly Betty", where Betty started a blog. I couldn't remember when that show aired, so I looked it up. April of 2010. Sheesh. It took me four years to get up the courage to start. Totally sounds like me, but still. I had things I wanted to say. 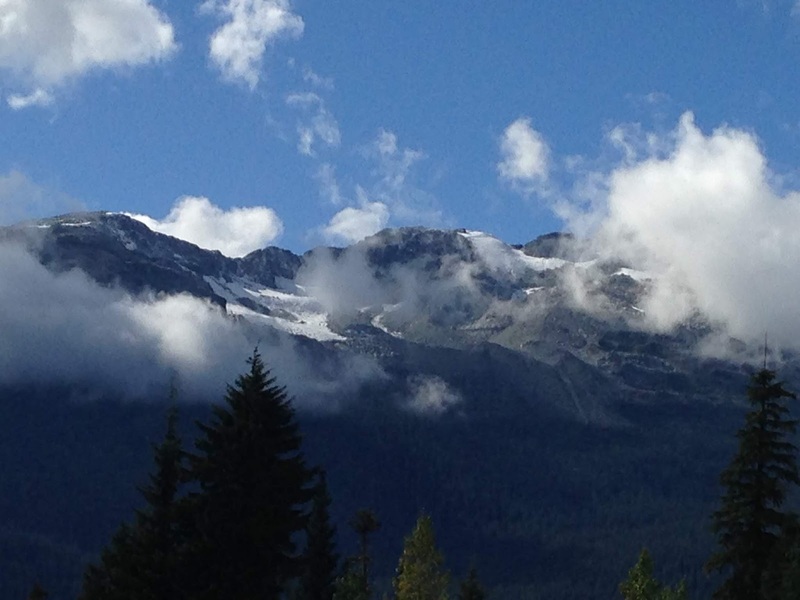 The empty nest was looming, I was getting older, and an online journal seemed like fun. I remember talking about it at length with the boys, because I wanted to make sure they wouldn't mind, being teenagers and all. I shouldn't have worried, since I'm not sure they've actually read a single post. In the end, "Two Teens And Their Mama" was born. I agonized over that name, which rather quickly had to be changed as those teens kept growing. The empty nest arrived sooner than I'd hoped, and I was so grateful to have this space to share and vent and complain and cry. 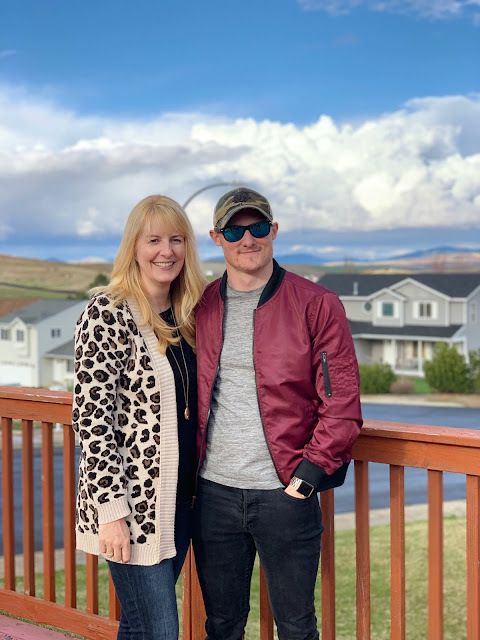 Conner was 19 when I started blogging. 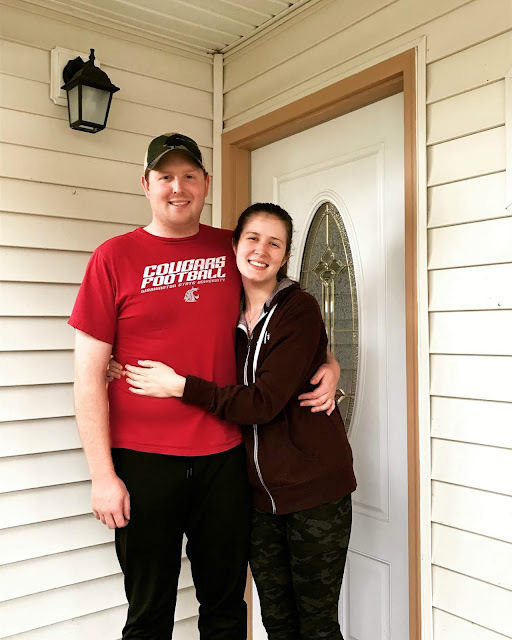 Today he has a successful career, the loveliest girlfriend, and he just bought his first home. Thomas was only 16 in 2014, and even then I couldn't fathom how I could possibly send him off to college without losing my mind. But in a few weeks, he'll have completed his undergraduate degree in Zoology, and be heading to Vet School in the fall. Time marches on, and hopefully, so will this blog. Thank you to everyone who has commiserated with me, cheered me on, and lifted me up when I needed it most. I'm hoping there will be another five years, no more name changes, and maybe some grandchildren? That should tell me if the boys are reading or not - I'll wait for the phone calls. In honor of my blogaversary, I'm giving away a beautiful, handmade necklace from Katia Designs. Catherine's pieces are so lovely and versatile, and I can't wait to share with one of you! Leave a comment below, and I'll draw a winner next week. Necklace will be similar, but not exact. Happy Thursday! The weekend is in view, and I blogged two whole times this week, so it feels like I'm winning. Athleisure wear has been a popular trend the past few seasons, but I have to admit I wasn't exactly sure what qualified. The google tells me that it's athletic clothes worn in other settings, like work or running errands. Sounds comfy, which is totally my style. And this outfit from Peach is both comfortable and stylish, so that's another win. 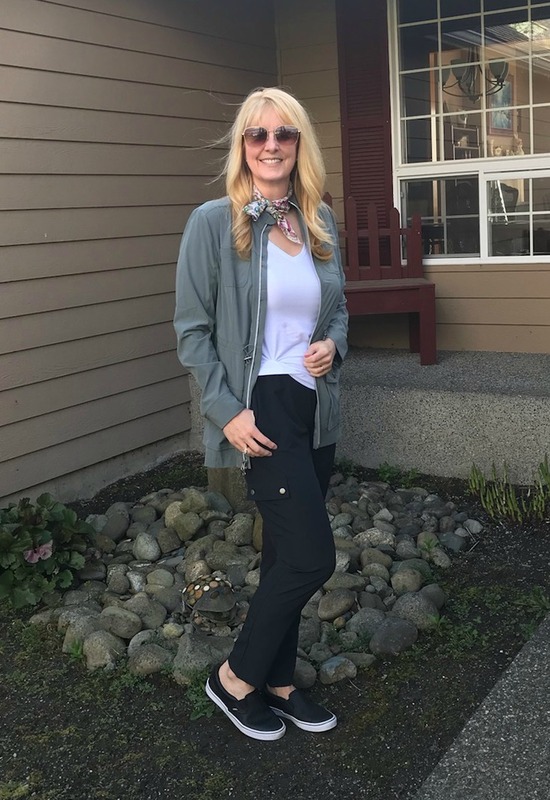 I'm wearing two pieces from their spring Havana collection - the Hemingway Jacket and the Morro Pant. They're made from a stretch woven that's lightweight and packable. I wore my usual sneakers, but you could add some heels for a dressier look. And I "borrowed" the final touch of a neck scarf from my friend Jodie at Jodie's Touch of Style. 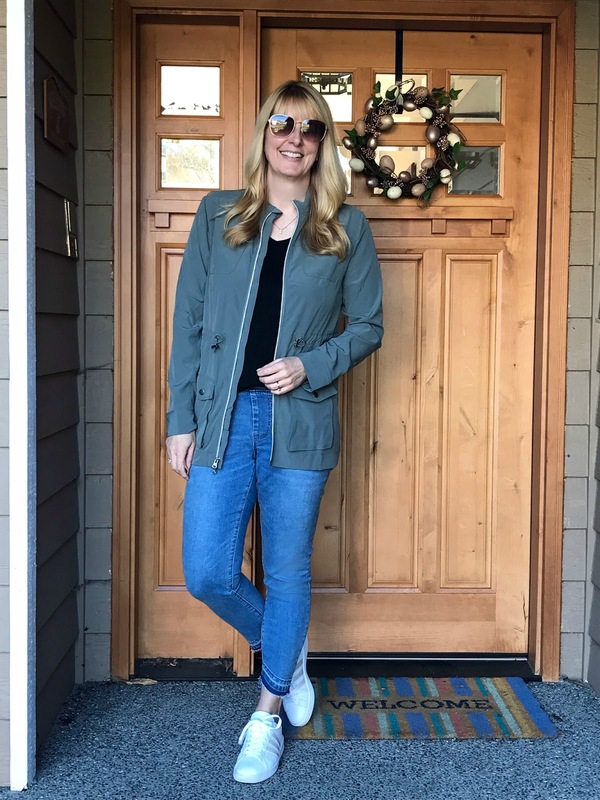 The jacket looks good with jeans too, and it's the perfect weight for spring transition weather. Peach also carries an essentials collection. These Barre Capri pants offer medium compression in a four way stretch knit. No "see through" worries during downward dog. And they're buttery soft. 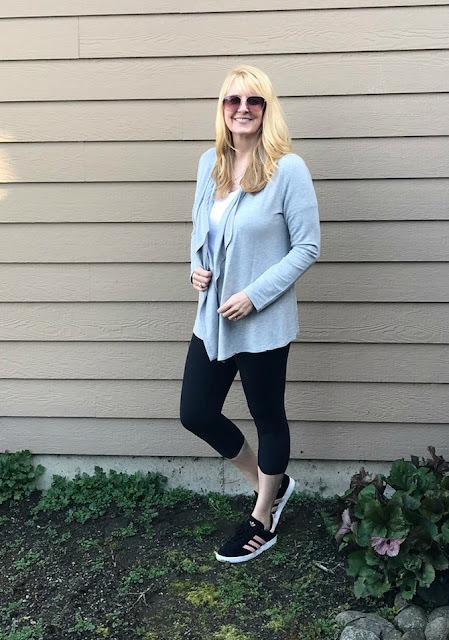 What do you think about the athleisure wear trend? Have a great weekend, friends. I'll be back on Tuesday with a big anniversary and a giveaway! The items in this post were provided to me from Peach in exchange for sharing their brand. All opinions are my own. Hello, hello! It's been a few weeks since I posted last, which wasn't my intention. I started writing a few times, then changed my mind, then I got busy, and blah blah blah, here we are. I'm still in a bit of a blogging rut, and wondering if I should give it up for good. 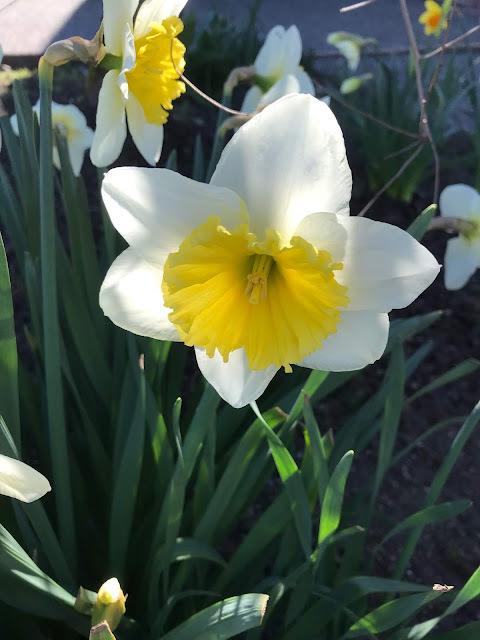 But like my daffodils, I keep coming back. I recently got a message from a friend (thank you, by the way), sharing that my blog has been helpful to her during this time of life. That meant a lot. I think we secretly hope that somebody is reading our words and getting value out of them. Then Jill from Doused in Pink nominated me for the Sunshine Blogger Award, which is given to those "who are creative, positive and inspiring while spreading sunshine to the blogging community." That's exactly what I want to be in this space, so it seems that the universe is telling me to keep on going. 1/ How did you first get into blogging? I started five years ago, after contemplating it for several years before that. One of my favorite shows was "Ugly Betty", and in the final episode she started a blog, which gave me the initial inspiration. I love to write, I needed a place to vent, and blogging seemed so easy. Ha. Famous last words. 2/ What has been the best strategy that has worked well for you to get more traffic to your blog? Trying to keep up with all the things is overwhelming, so this year I decided to focus on growing my Instagram, which has helped a bit. Next I'd like to work on Pinterest because everyone says that it's the best traffic driver. However, my account seems to have been suspended (no idea why - probably because I haven't been on in a year?) so I'm working on getting it back. 3/ How do you motivate yourself to keep your blog going? Clearly not very well, given my recent absence. But the connection with amazing people always brings me back. 4/ How would you describe your personal style and is there a person who is your go to for fashion inspiration? I work from home where no one sees me, so mostly I just dress for myself. I'd say my style is northwest casual, on the more feminine side. I love the style of all my TBB friends! 5/ What do you do in your spare time outside of blogging? I love to read, travel, and spend time hiking. 6/ What's on your summer wishlist? Getting outside. It was such a long winter and I'm ready to get out of this house. We have a few trips planned, but nothing major. Lots of family time. 7/ Has a stranger ever recognized you from your blog and stopped to say hi? Nope, not even once. That would be pretty fun though! 8/ What are your top 3 favorite brands? Kate Spade, Loft, Old Navy for inexpensive, trendy pieces. Thank you so much for the nomination, Jill. It truly helped bring me out of my blogging rut! And while I'm answering questions, it's also time for Laura's "3 Things". 1/ I'd like to get some flowers planted. Help Thomas move home for the summer. Undergrad is almost done - Vet School here he comes! Spend some quality time with my husband. 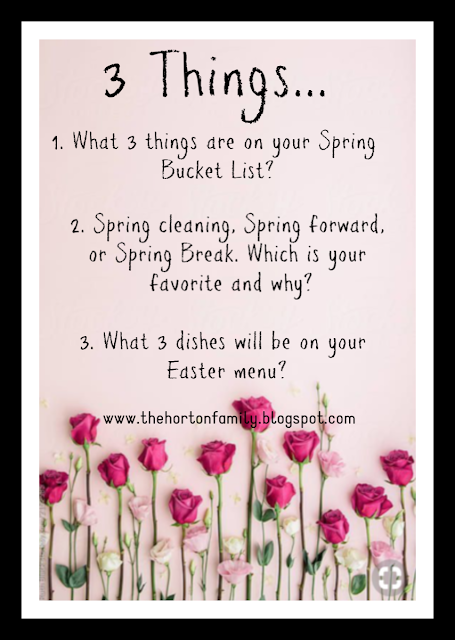 2/ It used to be Spring Break, but once your kids move out you forget when that is. Spring cleaning is always nice, and my closet especially needs some work. 3/ Deviled eggs, baked beans, scalloped potatoes. I've decided to go to a twice a week blogging schedule, on Tuesdays and Thursdays. Thank you so much for bearing with me. I really do love you all and appreciate the support. Happy Tuesday! 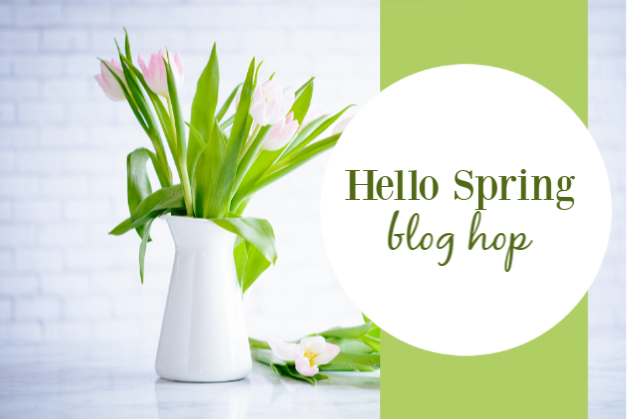 Today I'm spring hopping with my friends at The Blended Blog. 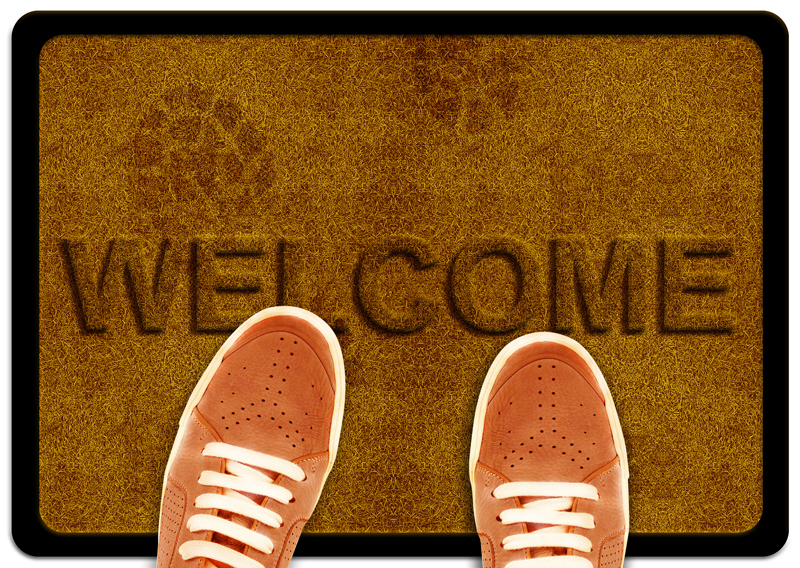 If you're coming from TBB, welcome to my home on the internet. So glad you're here! We're talking about all things spring, but spoiler alert...I live in Seattle. It won't be spring for at least another month, possibly two. The Pacific Northwest doesn't know how to check a calendar, and our seasons are always behind. 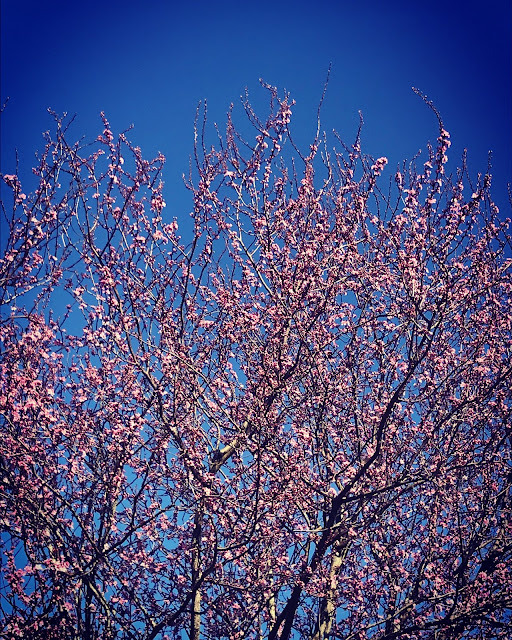 Even though it's not full on spring, there are two things we can count on this time of year: daffodils and cherry blossoms. I truly can't believe these beauties survived. They started to sprout in late January, right before our mega snow storms hit. The next few weeks saw them completely covered in two feet of the white stuff. Once it melted, they said "oh, hey", and resumed growing. Pretty sure there's a metaphor in there for how I should be doing my life. And the cherry blossom trees. 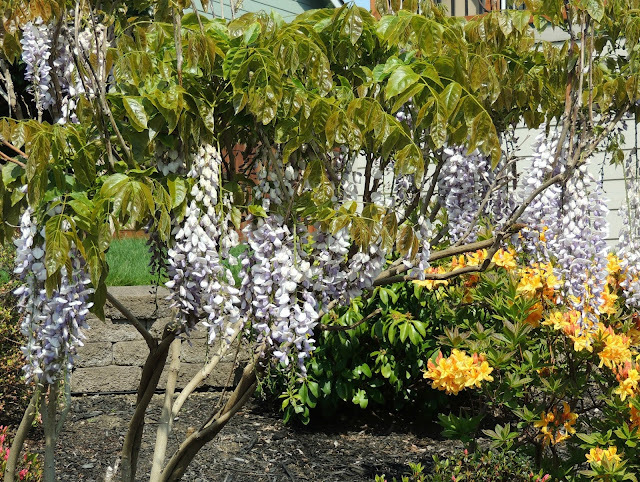 They are literally planted everywhere, and though their season is short, it's breathtaking to see them in full bloom. Last year - we're not quite there yet. 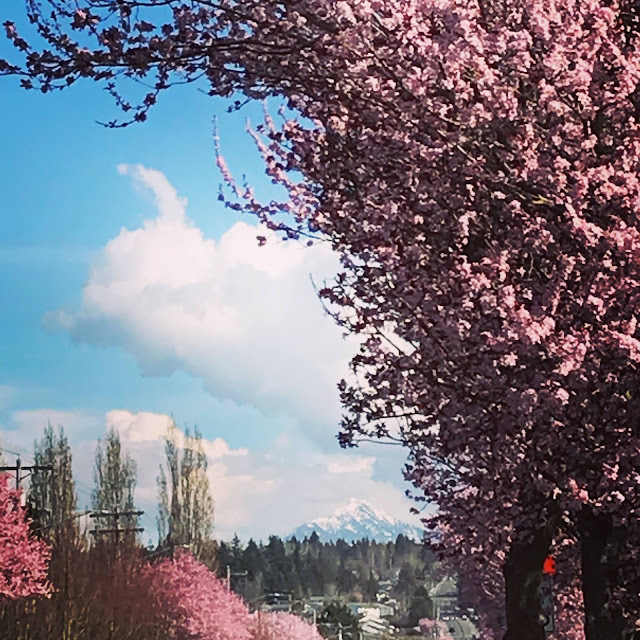 Once spring finally arrives, there's nowhere more beautiful than Seattle. All that rain makes the flowers very happy, so once the sun comes out, they return the favor. What's spring like where you live? Has it arrived yet? 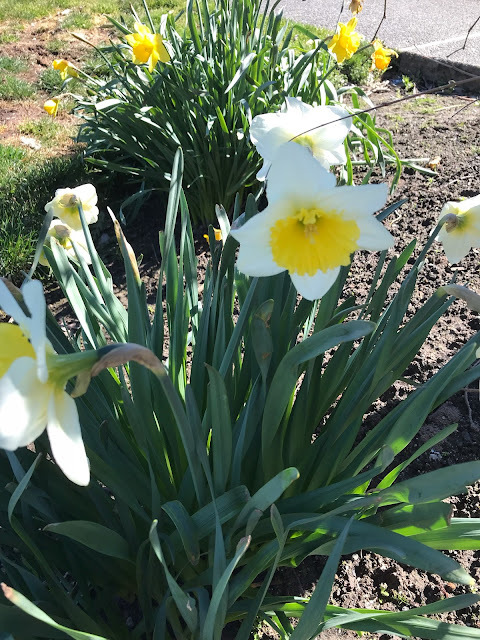 Next, hop on over to Deena's blog to see spring in the far north of Saskatchewan, Canada. Happy Wednesday and welcome to TBB Style with The Blended Blog. Our fabulous hostess this week is Vanessa, so be sure to pay her a visit and add your post to the link up! This week we're sharing our St. Patrick's Day style, and even though it's already passed, green is a perfect color for spring. Although I don't have a lot of it in my closet, and I struggle every year when St. Paddy's comes around. I'm a tiny bit Irish, on my Grandma Mary's side, and I love a little corned beef and cabbage with a small shot of Jameson. But I need to up my green game! 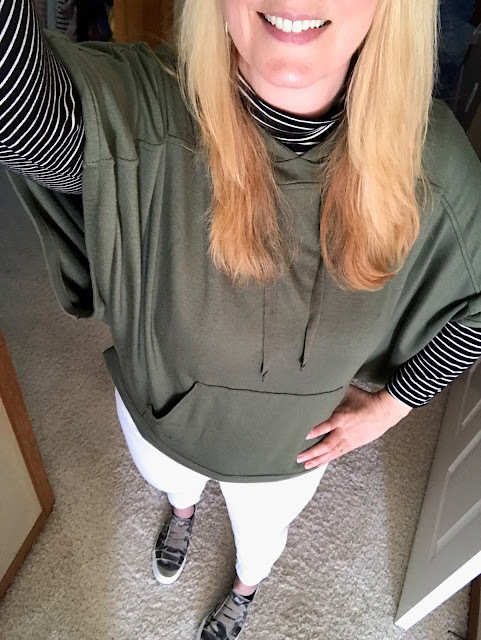 On Sunday, I wore this olive green poncho from Lou & Grey, with white jeans and Blowfish camo sneakers. Sadly, I think this poncho is not for me. I almost broke my arm a hundred times, catching it on every door knob and corner. Or maybe I just need to slow down. 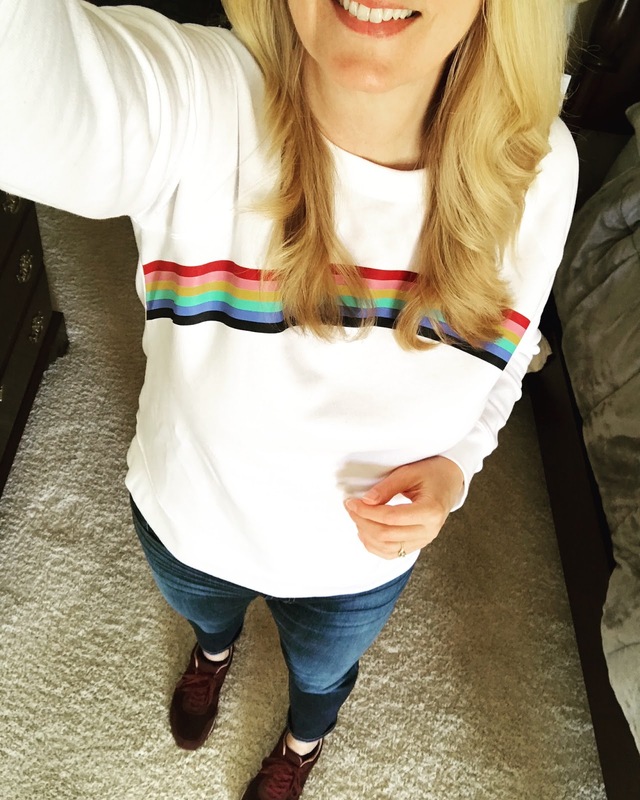 This cute sweatshirt from Old Navy works if you're not wanting to go "all out green". That fourth stripe down totally counts. What do you wear for St. Patrick's Day? Give me some ideas for next year! Head to The Blended Blog and link up your posts, or follow along on Instagram with #theblendedblogstyle.